The morning and I have a hate-hate relationship that has seen more than one alarm clock shatter against an unyielding wall, so I don’t really know why a Microsoft developer would feel the need to code an alarm app that forces you to play unnecessarily ‘quirky’ and ‘fun’ games to turn it off. 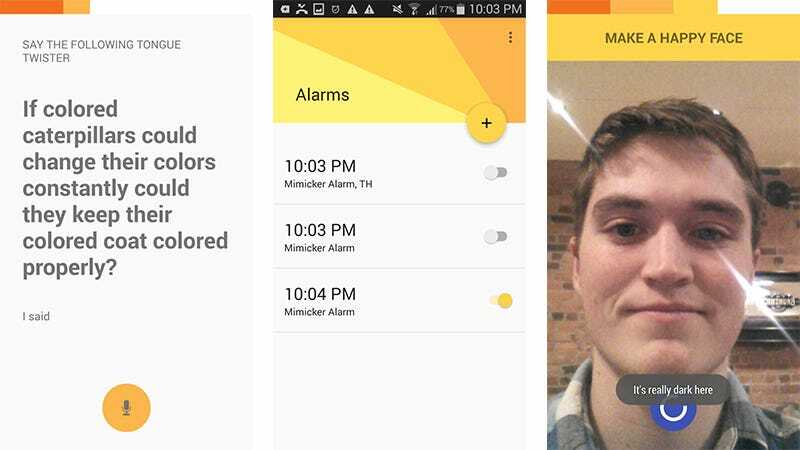 Mimicker is a free download on the Play Store, and it’s not exactly a complicated concept: set your alarm, and when the time comes, you have to either mimic a some particular kind of selfie (ugh), try a tongue twister, or find a color. I tried all three of these things sober and awake, and failed every time. I value my phone too much to actually try waking myself up with this app, but I’m pretty certain it would either successfully arouse me from the deepest of slumbers, or break some consumer electronics trying.